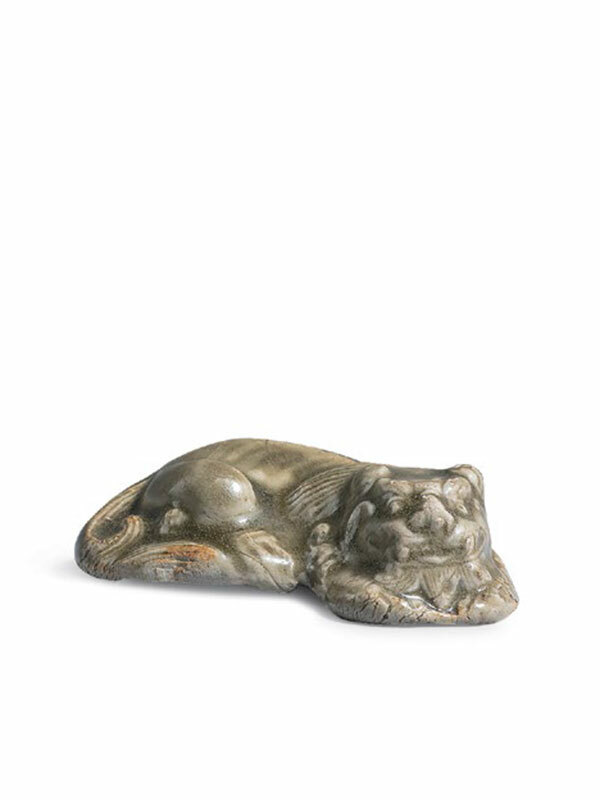 A yaozhou stoneware model of a recumbent lion. The animal turns its head toward the right side of its body, with ears folded down, its four legs tucked under its body and paws resting flat on the ground. The round eyes, strong jaw, and curly mane are well defined. The tail is curled around the hindquarters. The surface is covered in a lustrous translucent olive-green glaze, which pools to a slightly darker colour in the recesses. The base is recessed and unglazed, showing the original buff body. In China, lions were admired for their strength and courage, and were associated with military and hunting prowess. Lions (shi) were not indigenous to China, but were known in Iran and the Near East where they were associated with royalty. It was in India where they acquired religious meaning as temple guardians, and they were later known in China as ‘protectors of Buddhism’. 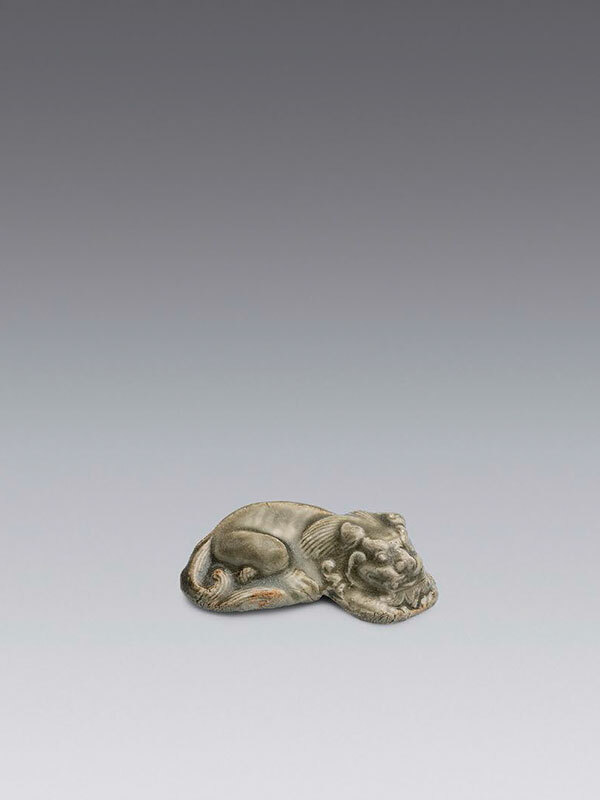 Real lions were actually sent to China as tribute as early as 87 BC.1 Small ceramic lion models were produced earlier, such as a Tang dynasty (618 – 906) seated lion paperweight made in the Changsha kiln  or a Five Dynasties (907 – 960) example produced in the Yue kiln. Lion figures produced in the Yaozhou kiln are extremely rare. Fragments of three comparable small lion figures and some oil lamps in the form of a recumbent lion were unearthed from the Yaozhou kiln site at Huangbaozhen, Tongchuan county, Shaanxi province. A further comparable lion figure in the form of an incense burner top, dated to the Northern Song dynasty, is in the collection of the Cleveland Museum of Art.